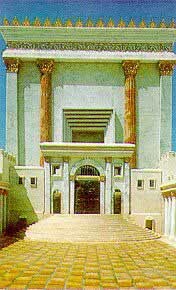 The crowning achievement of King Solomon's reign was the erection of the magnificent Temple (Hebrew- Beit haMikdash) in the capital city of ancient Israel - Jerusalem. 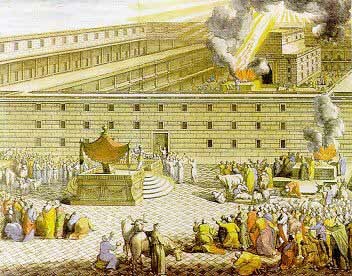 His father, King David, had wanted to build the great Temple a generation earlier, as a permanent resting place for the Ark of the Covenant which contained the Ten Commandments. A divine edict, however, had forbidden him from doing so: "You will not build a house for My name," God said to David, "for you are a man of battles and have shed blood" (I Chronicles 28:3). The Bible's description of Solomon's Temple (also called The First Temple) suggests that the inside ceiling was was 180 feet long, 90 feet wide, and 50 feet high. The highest point on the Temple that King Solomon built was actually 120 cubits tall (about 20 stories or about 207 feet). 3:3- "The length by cubits after the ancient measure was threescore cubits, and the breadth twenty cubits". 3:4- "And the porch that was before the house, the length of it, according to the breadth of the house, was twenty cubits, and the height a hundred and twenty; and he overlaid it within with pure gold." Solomon spared no expense for the building's creation. He ordered vast quantities of cedar wood from King Hiram of Tyre (I Kings 5:20­25), had huge blocks of the choicest stone quarried, and commanded that the building's foundation be laid with hewn stone. To complete the massive project, he imposed forced labor on all his subjects, drafting people for work shifts that sometimes lasted a month at a time. Some 3,300 officials were appointed to oversee the Temple's erection (5:27­30). Solomon assumed such heavy debts in building the Temple that he is forced to pay off King Hiram by handing over twenty towns in the Galilee (I Kings 9:11). When the Temple was completed, Solomon inaugurated it with prayer and sacrifice, and even invited non­Jews to come and pray there. He urged God to pay particular heed to their prayers: "Thus all the peoples of the earth will know Your name and revere You, as does Your people Israel; and they will recognize that Your name is attached to this House that I have built" (I Kings 8:43). Sacrifice was the predominant mode of divine service in the Temple until it was destroyed by the Babylonians some four hundred years later, in 586 BCE. Seventy years later, after the story of Purim, a number of Jews returned to Israel - led by the prophets Ezra and Nehemiah - and the Second Temple was built on the same site. Sacrifices to God were once again resumed. During the first century B.C.E., Herod, the Roman appointed head of Judea, made substantial modifications to the Temple and the surrounding mountain, enlargening and expanding the Temple. The Second Temple, however, met the same fate as the first and was destroyed by the Romans in 70 C.E., following the failure of the Great Revolt. God's world is great and holy. The holiest land in the world is the land of Israel. In the land of Israel the holiest city is Jerusalem. In Jerusalem the holiest place was the Temple, and in the Temple the holiest spot was the Holy of Holies.... There are seventy peoples in the world. The holiest among these is the people of Israel. The holiest of the people of Israel is the tribe of Levi. In the tribe of Levi the holiest are the priests. Among the priests, the holiest was the High Priest.... There are 354 days in the [lunar] year. Among these, the holidays are holy. Higher than these is the holiness of the Sabbath. Among Sabbaths, the holiest is the Day of Atonement, the Sabbath of Sabbaths.... There are seventy languages in the world. The holiest is Hebrew. Holier than all else in this language is the holy Torah, and in the Torah the holiest part is the Ten Commandments. In the Ten Commandments the holiest of all words is the name of God.... And once during the year, at a certain hour, these four supreme sanctities of the world were joined with one another. That was on the Day of Atonement, when the High Priest would enter the Holy of Holies and there utter the name of God. And because this hour was beyond measure holy and awesome, it was the time of utmost peril not only for the High Priest but for the whole of Israel. For if in this hour there had, God forbid, entered the mind of the High Priest a false or sinful thought, the entire world would have been destroyed. To this day, traditional Jews pray three times a day for the Temple's restoration. Over the centuries, the Muslims who eventually took control of Jerusalem built two mosques on the Temple Mount, the site of the two Jewish Temples. (This was no coincidence; it is a common Islamic custom to build mosques on the sites of other people's holy places.) Since any attempt to level these mosques would lead to an international Muslim holy war (jihad) against Israel, the Temple cannot be rebuilt in the foreseeable future.